Today, we have two excellent surgical case studies to share. This pair of video case studies is part of our MED-EL Surgical Video Library, so they’re presented in full HD video. With 4K resolution, you’ll have a clear view of surgical techniques and anatomical structures, including the mastoidectomy, posterior tympanotomy, opening of the round window membrane, and insertion of the electrode array. 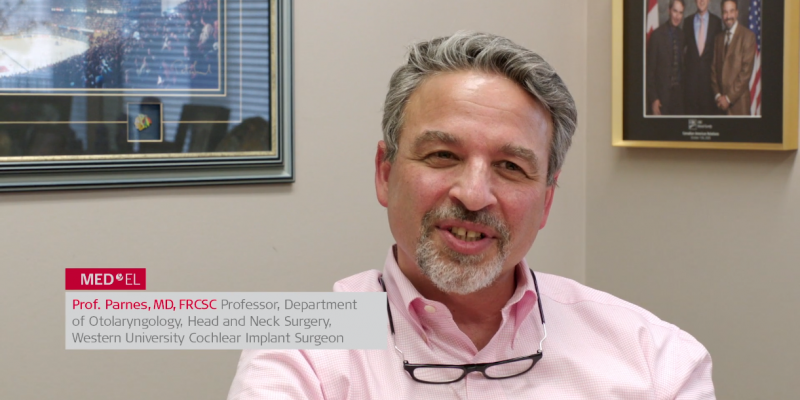 In this pair of case studies, Prof. Dr. Lorne Parnes demonstrates his surgical technique for both left and right side cochlear implantation with the CONCERTO Cochlear Implant. Prof. Parnes is Medical Director at the hearLIFE clinic of Ontario and chief surgeon of the cochlear implant program at the London Health Sciences Center in London, Ontario. 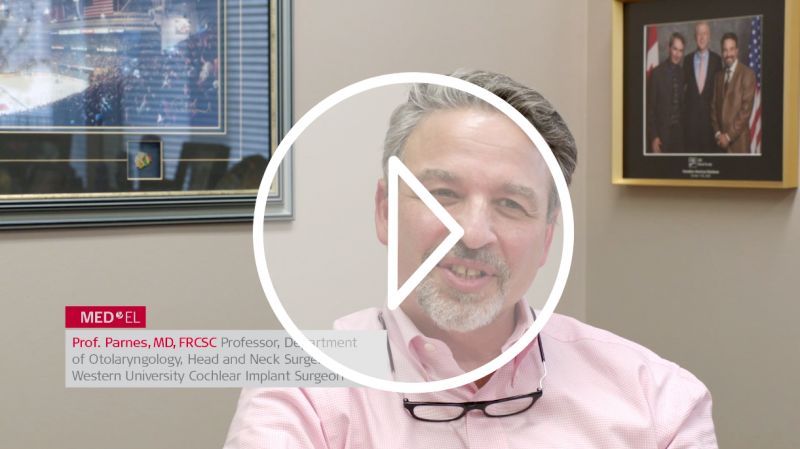 In these two high-definition case studies, you’ll see Prof. Parnes demonstrate his technique for implanting the CONCERTO cochlear implant in the right ear and the left ear. This provides a unique opportunity to compare his techniques between left and right ear. Prof. Parnes also provides a clear demonstration of his technique for drilling an electrode lead channel, which protects the electrode lead from external impacts. He performs structure preservation techniques, including the use of round window approach and slow electrode array insertion. His first patient is a 61-year-old female who has had bilateral progressive hearing loss since the age of 12. She has used hearing aids since the age of 30, but has experienced minimal benefit from hearing aids for the past 7 years. For these past 7 years, she has not worn a hearing aid in her left ear and has only worn her hearing aid in the right ear sporadically. Pre-operative testing shows she has severe-to-profound bilateral sensorineural hearing loss. For this patient, Prof. Parnes utilized a CONCERTO with FLEX28 electrode array. This patient was implanted in her right ear, which was her slightly better ear. His second patient is a 38-year-old female who also has had bilateral progressive hearing loss since she was a teen. She has worn bilateral hearing aids since the age of 24. Preoperative testing showed severe-to-profound bilateral sensorineural hearing loss, with AzBio Sentences test scores of only 4%. 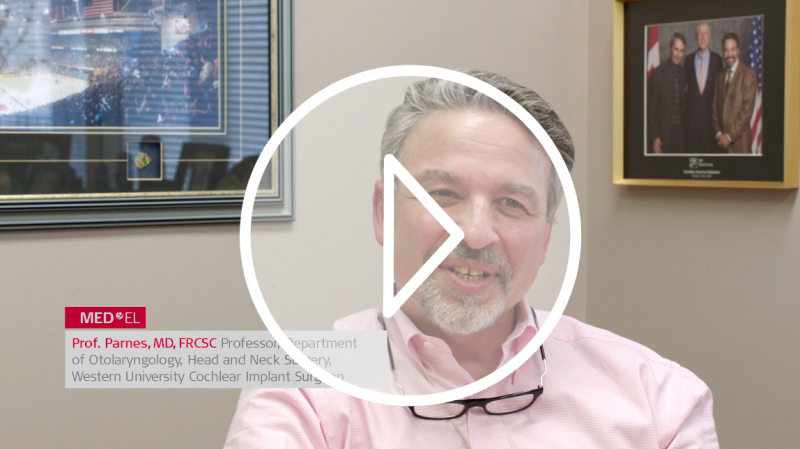 For this patient, Prof. Parnes utilized a CONCERTO cochlear implant with STANDARD electrode array. This patient chose to be implanted in her left ear. We’ll be posting more case studies here on our MED-EL Professionals Blog—don’t forget to subscribe to get the latest articles sent right to your inbox!